Discover the Geodesy museum in Castelo Branco, Portugal. 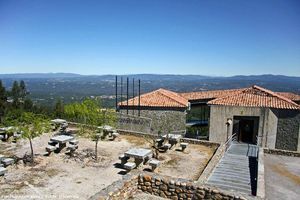 The Geodesy Museum is located next to Picoto da Melriça, in the Geodesic Centre of Portugal, in Castelo Branco district. This is a unique museum in the country that results from a collaboration agreement between the Câmara Municipal of Vila del Rei and the Portuguese Geographic Institute. From this museum you can get an excellent panoramic view of the surrounding area. The museum exhibits objects and documents about Picoto da Merliça and cartographic evolution from the 19th century onwards. It features a small store, auditorium, and bar. Vila de Rei, Castelo Branco.